1. / 2. / 3. / 4. / 5. / 6. / 7. / 8. / 9. I certainly am on a Valentine's kick, huh?! All of these lovely soft colors are just calling my name. What's inspiring you? Follow along via Google Friend Connect or Bloglovin! Love your picks. That #1 is an adorable picture. Ohhhhh...I love all the pretty colors happening here. Mint and blush are a perfect combo! Love all the pastel pinks! So beautiful!!! Our pinboards could be twins! 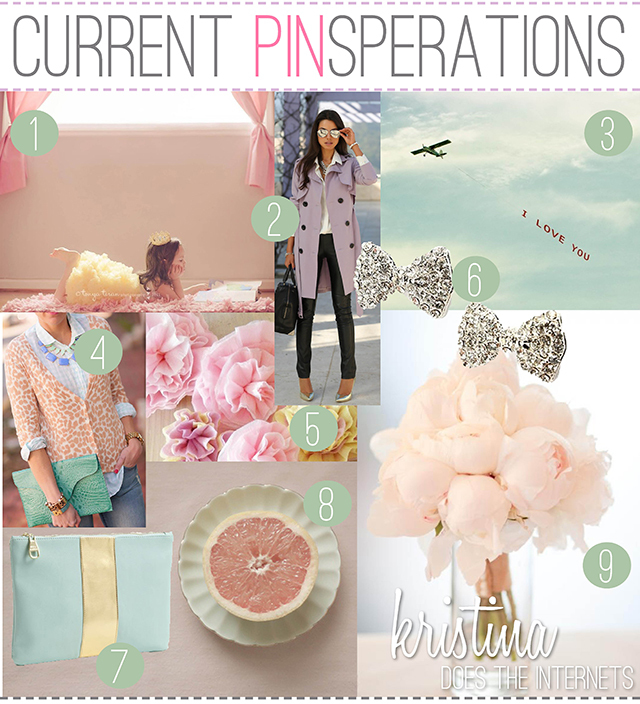 I repinned #4 and #9 myself :) I just love pastels for spring this year. I've never been a pastel person but I'm loving it this year! I LOOOVE these soft pastels! I'm ready for spring!!! I love all of these soft pretty colors - especially those flowers, so gorgeous! I really love this post. Fabulous inspo girl. Your blog is wonderful. If you could stop by and check out my latest post, it'd mean a lot!